Having a sunburn blister is definitely not fun. Not only does it almost instantly begin to hurt when touched within hours of sun exposure, but it also becomes quite frustrating as it begins to itch and even peel. Many people go out and sunbathe in the sun until they are burnt—sometimes severely—without ever applying sunscreen. Although you may think that these burns are normal and not an issue, we beg to differ. Throughout this article we will examine all you need to know about having a sunburn blister—including the necessity of prevention. You will notice a sunburn blister within hours after sun exposure. As mentioned above, these burns are initially associated with unwanted pain, especially when touched. However, other signs of sunburn include warmness in the burnt area—it will literally emit heat that you can feel by placing your hand over the burn. Furthermore, this area will become red and may swell depending on the severity. Severe burning will be associated with other symptoms, such as a fever and swollen lymph nodes (specifically in the armpit or neck areas). It is essential to note that you should not place a bandage over the blistered area. Instead, you should be sure to wear loose clothing to keep it from touching the blisters as much as possible. Soft fabrics like cotton are highly recommended as opposed to jean-like material. For minor sunburns, be sure to apply lotion that is high in moisture and contains aloe vera for quicker healing and a decreased chance of peeling. If you touch the area, it is suggested that you clean your hands first to keep from spreading an infection into the burnt area—this is especially true for a severe sunburn blister that may actually contain pus inside. The best sign of serious sunburn is the development of large blisters on the affected area. Typically this is a sign of second degree burns that should be treated by a medical professional for best results. Again, fever is common for these more serious burns. Repeated blistering is known to be linked with an increase of the person’s chances of skin cancer—this alone should encourage you to seek prevention methods, which leads us to the next topic of this article. There are multiple methods for sunburn prevention. The most obvious is to avoid prolonged sun exposure, especially during the summer months. If you will be outside frequently throughout the day, be sure to bring sunscreen and apply it to all exposed areas. Note that a sunscreen of at least 30 SPF is highly recommended for best results. Many brands also come in waterproof forms to enable you to enjoy the outdoors at a water park while still being protected. Take advantage of these ingredients but be prepared to reapply occasionally throughout the day. Also note that some areas are more prone to severe burning and skin cancer than other areas of your body—specifically the ears. The skin surrounding your ears is very sensitive and prone to burning; furthermore, many people forget this area when applying sunscreen. Therefore, make sure you apply sunscreen to your ears during the sunscreen application period. 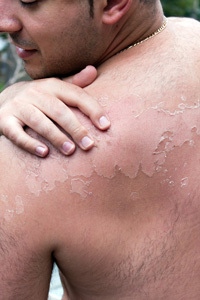 In conclusion, a sunburn blister can range from relatively mild to severe. If the affected area blisters up, it is essential that you seek medical attention to ensure a faster, healthier recovery. However, if the burn is minor you can purchase lotion over the counter containing aloe vera to minimize the burning sensation. Nevertheless, the best method to keep from dealing with sunburn is to be proactive about prevention methods. Make sure to apply sun block on a regular basis when you plan to be exposed to the sun for more than a few minutes and frequently venture into shaded areas.